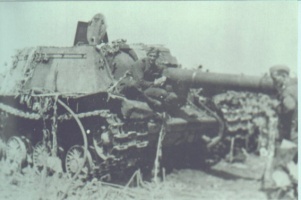 SU-152 initially mounts a 152mm howitzer. This gun should use mostly HE rounds since AP round can't penetrate most heavy tanks' front armor or snipe weak spots with its poor accuracy, but it’s HEAT is very stronk, with 250mm of pen. For sniping use the upgraded 122mm series gun. 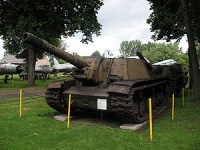 The upgraded 122mm gun the same 175mm penetration like its tier VII 122mm counterparts, good damage and very high rate of fire for such a large weapon. Beware, this tank doesn't carry much ammo, so for trigger happy folk, consider yourself warned. 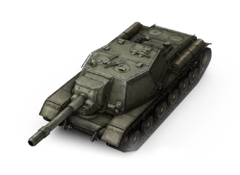 However some people prefer to play with the stock 152mm which can hurt any tank you face and has advantage of increased module damage, like destroying tracks of enemy tanks you hit, immobilizing them while you reload. Weak armor for tier 7. 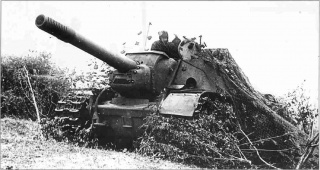 122mm guns have low penetration against higher tier 8/9 targets. 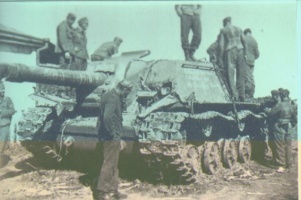 Low accuracy with the 152mm. 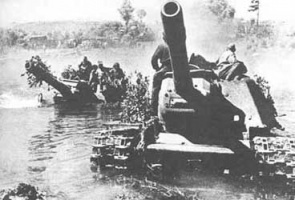 For the 152mm gun, it is advised to buy least some premium HEAT ammunition if you can afford it. It has 250mm penetration for an average 545 damage. Basically, that's a mini BL-10, so you can give yourself a little preview of what's to come. HEAT ammunition should he used mainly in close range due the low accuracy and shell velocity of the gun. Avoid hitting sloped portions of tanks with high armor. With a gun with monstrous damage and penetration when using premium ammunition, target the strongest enemies first, as they can do a lot of damage to your team. The earlier they die, the better. Avoid wasting shots on light or low health tanks at all costs. The 152mm gun should not generally use AP at all. With 135mm of penetration, with really bad accuracy, most targets it can penetrate are better handled with HE shells. However, AP is optional if you are pretty good in this tank. 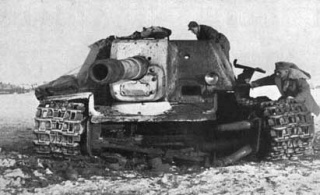 Compared to premium SU-122-44 this tank has the same damage, penetration, and somewhat higher rate of fire with its 122 mm guns. 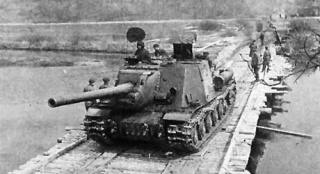 The difference is that the SU-122-44 is more maneuverable, has a lower profile and better armor, whereas the SU-152 has more health and better rate of fire. Due to the 122mm gun's playstyle, it works better on the SU-122-44, but it works just fine on this. 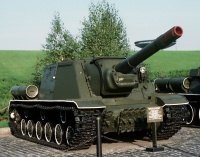 It is highly recommended to get both 122mm guns as they carry over to the ISU-152 and are required to unlock the BL-10, which reduces the grind substantially. This page was last modified on 20 October 2017, at 03:01.